In September 2015, the SPSS undertook the first ever Mare Grading & Youngstock Evaluation Tour covering 3 countries, 6 regions and 7 venues. During the tour 50 mares were graded into the SPSS Studbook and 64 foals to 3 year olds were evaluated with 7 being awarded a prestigious Gold Premium and 54 a standard Premium. The SPSS Studbook Manager, Lucy Sheldrake, and the rest of the team are delighted with the success of this new initiative and are already looking at possible venues for next year. We welcome any suggestions and indications of likely support for something in a specific area and can be contacted on 07703 566066, sportsponies@gmail.com or via the SPSS Facebook page. In addition, a 7th Regional event was be held alongside the central Stallion Grading at The College Equestrian Centre, Keysoe, Bedfordshire on the 16th & 17th October. Again, it was well supported with 12 mares coming forward to grade, all of whom were successful, and 15 more youngstock were evaluated, with one gaining a Gold Premium and the rest a standard Premium. All the youngstock who gained a Gold Premium were eligible to enter the Youngstock Final on the 16th October and although the long journey prevented some from attending, it was still a hard decision for the judges, Hans-Heinrich Brüning, Jacke Mathieson and Geoff Glazzard. Each entrant was seen individually, in-hand and loose before they all entered the arena together and walked around while the judges had a last look and selected their winners. First to be announced was the Small Horse Champion which was awarded to Wadacre Stud's colt foal Wadacre Benjamin who had gained his Gold Premium at the North Wales & North West Evaluation. 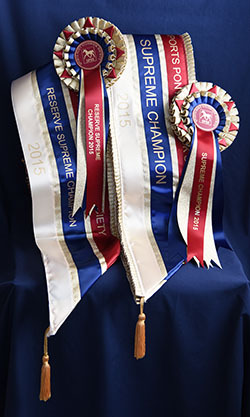 Then the Pony Champion's sash was awarded to Penny Walster's SPSS passported Miss Luna Eclipse who is by SPSS graded Classic's Charmeur out of SPSS graded Hilkens Mighty Gold (by Joldis Charmant. Luna is a Cremello Yearling Filly who was bred by Emma Middlehurst in Cheshire. The Reserve Pony Champion was another owned by Penny, but this time one she bred herself, the 2 year old Welsh part-bred gelding Bathleyhills Golden Lustre by SPSS graded Bathleyhills Monet out of SPSS graded Bathleyhills Touch of Lustre (by SPSS graded Thistledown Copper Lustre). Then the judges announced the Supreme and Reserve Supreme Champions with the Supreme Champions Sash, a SPSS Thermatex rug and a lovely trophy presented by Horsology going to Miss Luna Eclipse and the Reserve Supreme Champion (who also received a Sash and a photo frame kindly provided by Horsology) was Bathleyhills Golden Lustre. Horsology also kindly donated a £10 voucher for Scarlet & Pink to all those entrants who attended the youngstock final. There is a short report on each Regional Event followed by the full results with information about each pony's breeding below. Specialist equestrian photographer Julia Shearwood was in attendance at all of the gradings and evaluations and the photos are available to view and purchase here. Please note that NO photographs on the SPSS site may be copied without the express permission of the photographer. 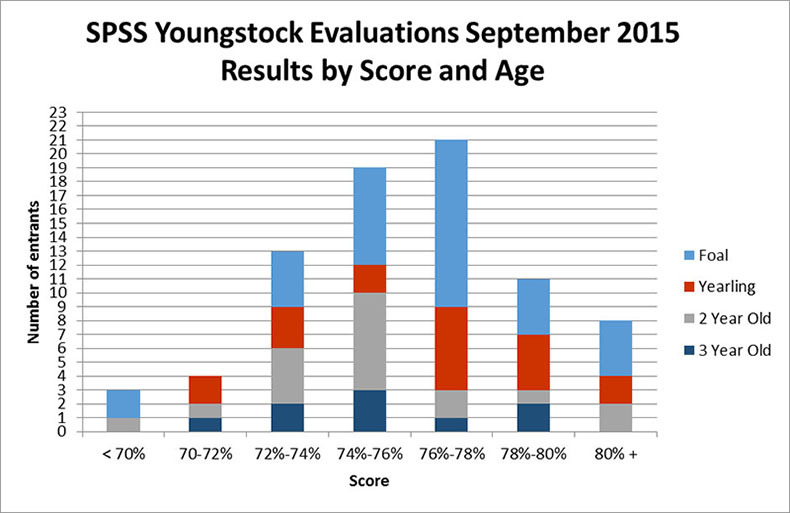 In 2015, as well as grading mares, the SPSS also offered youngstock evaluations at 7 regional venues around Great Britain so that foals, yearlings, 2 and 3 year old fillies, colts and geldings could be assessed along similar lines to the mares. With the same judges as for the mare grading, the high quality of youngstock evaluated was such that of the 79 assessed, all bar three gained at least a Premium score of 70% or more and 8 outstanding youngsters gained a coveted GOLD premium. The judges throughout the tour and at the final event were Hans-Heinrich Brüning and Jacke Mathieson. At the first event, one very impressive foal achieved the 80% threshold to gain a coveted SPSS Gold Premium and, of the others, all bar one gained a Premium. The Gold Premium winner, DBM Good Golly Miss Molly was bred by her owner, Kristina Floyd-Walker of DBM Dressage. A filly foal who is expcted to mature at or under 148cm, Molly is by Kristina’s young German-bred pony stallion Good Luck (who then graded with the SPSS in October) out of her Welsh Section C mare, Pasadena Saleen, who is by Synod Ruskin. Kristina also successfully presented Saleen for mare grading and she went into the Main Studbook. At the second venue, the high quality of youngstock evaluated was such that all bar two gained at least a Premium score of 70% or more and two very impressive youngsters achieved the 80% threshold to gain a coveted SPSS Gold Premium. The Gold Premium winners were the British Sports Horse Aberaeron Santillana Valentina and the SPSS colt foal Delaroche Black Gold. Aberaeron Santillana Valentina is a yearling Welsh Part-bred filly expected to mature at between 148cm and 158cm. Bred and owned by Johanna Evans-Shaw, she is out of Johanna's homebred Welsh Cob Section D brood mare, Aberaeron Black Bess and sired by black leopard spot Dutch Warmblood Grade B stallion, Palousa San Sebastián. Home produced by Johanna and her husband Gary Evans, this filly is 6th generation of Aberaeron breeding, going back to Gary’s grandfather’s first Welsh cob, born in 1944. Delaroche Black Gold is by SPSS graded Hilkens Gold Card out of Hilkens Georgia and was bred and owned by Lucy Sheldrake. Expected to mature at or under 148cm, Black Gold is one of Hilkens Gold Card's first foals and, from first sight, Lucy says she knew he was special. Day 3 saw another group of quality youngstock forward for evaluation, with all those presented gaining at least a Premium and one a coveted Gold Premium rosette. This went to the British Warmblood colt foal Wadacre Benedict bred and owned by Jeanette Matthews-Griffiths. Benedict is by Bretton Woods out of Jeanette's homebred SPSS graded Wadacre Watch Me !. Expected to mature at between 148cm and 158cm, Benedict's dam is by Waikki of Wadacre out of the British Riding Pony, Byrowans Bali Hi (by Hurstead Spruce). Wadacre Watch Me ! is also the dam of the 2011 SPSS Champion Stallion, Wadacre Super Trooper (by Sarkozy) and her 2 year old son, Wadacre Spiderman, by the Oldenburg Strahlemann (Sandro Hit x Weltmeyer), successfully passed the 015 SPSS Stallion Grading in October. On the fourth day of the tour, the judges had visited Bathleyhills Stud near Newark in the morning where they were delighted to see more quality youngsters including two very impressive ponies who achieved the 80% threshold to gain a coveted SPSS Gold Premium. The Gold Premium winners were Penny Walster’s SPSS passported yearling filly Miss Luna Eclipse who was bred by Emma Middlehurst and is by SPSS graded Classic's Charmeur out of SPSS graded Hilkens Mighty Gold (by Joldis Charmant) and the 2 year old part-bred Arab filly Bathleyhills Dressed Up who was bred by her owner, Penny Walster, and is by SPSS graded Bathleyhills Monet out of SPSS graded Daisy Dressman (by Dressman Junior). The judges then moved on to Leamside Equestrian near Durham, where as well as grading mares they were also pleased to see yet more quality youngstock with all those evaluated gaining at least a Premium (which didn't happen at all venues). The highest scoring youngster was Leamside Equestrian Ltd's SPSS passported palomino colt, Godrics Mr Bo Jangles. A 2 year old by SPSS graded Bathleyhills Monet, My Bo Jangles is out of the 2015 North East Champion mare, No Promises, who is by one of Leamside's resident SPSS Elite graded stallions, Caesar 171. The final day of the tour saw the SPSS team in Scotland, where they visited 2 venues and saw a good selection of youngstock at both, all of whom gained a Premium. The judges were once again delighted to be able to award a coveted Gold Premium, this time to the very last youngster seen in the week’s tour, the filly foal Lochlanes Dreamweaver. Bred by Jean Feeney, Dreamweaver is by Debonair out of the SPSS graded Welsh Section C Synod Galina (by Synod Rum Punch). The same pair of judges, Hans-Heinrich Brüning and Jacke Mathieson, also presided over the final youngstock evaluations on the 16th October. The last chance to qualify for the Final saw a quality field forward, all of which were awarded at least a Premium but the judges only considered one pony to be worthy of a sought after Gold Premium and that was Bathleyhills Golden Lustre. Registered as a Welsh part-bred, "Jeremy" was bred by his owner, Penny Walster and is by her own SPSS graded stallion Bathleyhills Monet out of SPSS graded Bathleyhills Touch of Lustre - who herself is by another of Penny's SPSS graded stallions, the WPCS Sec B. Jeremy is a Palomino 2 year old gelding and he was awarded a High First Premium (Dressage) by the BEF Futurity as a foal. Jeremy went on to stand Reserve Supreme Champion at the Youngstock Final later that day. For a full list of the youngstock see below. More photos of the youngstock presented at the 2015 evaluations can be viewed and purchased on Julia Shearwood Photography's website. Our congratulations to all the successful youngstock owners and breeders.